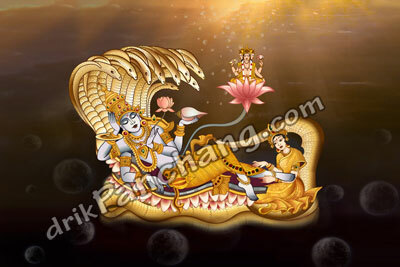 Paush Shukla Paksha Ekadashi currently falls in month of December or January while Shravan Shukla Paksha Ekadashi currently falls in month of July or August in English calendar. Putrada Ekadashi during Paush month is more popular in North Indian states while people in other states give more importance to Putrada Ekadashi during Shravana month. Benefits - Hinduism gives utmost importance to rituals performed at the time of the birth and the death. Hinduism prescribes certain rituals at the time of the death which should be performed by the son only. It is believed that funeral rites should be done by the son and it is must for the liberation of the soul. The son also performs duty of performing regular Shraddha to please the soul of the dead person either on the Earth or in the Heaven. Not conceiving a boy child becomes a misery for couples who believe in the "life after death" concept of Hinduism. It is advised that couples who wish to conceive a boy child should observe Putrada Ekadashi fasting. Shravan Shukla Paksha Ekadashi is also known as Pavitropana Ekadashi or Pavitra Ekadashi especially among Vaishnava community.